ANC H.Q. Moving to Tanzania? 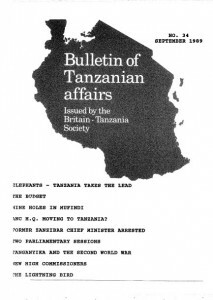 Television viewers in Britain were taken by surprise in the middle of May 1989 when, on two successive mid-day news bulletins on ITV, Tanzania was not only the main news item but also occupied a major part of the news. A coup d’etat is usually necessary before normally peaceful Third World countries can receive such prominence in the British media. The subject was the elephant and the danger of its complete disappearance from most of Africa in the not too distant future. President Mwinyi had, in discussions with Prince Bernhard of the Netherlands, Honorary Chairman of the World Wildlife Fund, on May 21st stated that he advocated an international mandatory ban on trade in ivory. And, to the delight of conservationists, he had, not only the enthusiastic support of Kenya, but within the following month, the support of a large part of the world. On May 26th Mrs Virginia Bottomley announced in Parliament that Britain would urge the whole European Community to impose an immediate ban on the import of raw ivory. She even went as far as to say that she would have no objection to SAS troops being used in tracking down poachers. On June 9th Britain announced its ban. On June 5th France banned ivory imports. Most EC member countries followed suit during the following days; Switzerland announced its ban on June 12th. On June 6th the United States, and, very significantly, the Emirate of Dubai – a key link in the chain of ivory trading – announced import and trade restrictions on ivory. Finally, on June 15th, Japan, which consumes 40% of the world’s ivory (mostly for hanko, the seals Japanese use on documents instead of signing), with its customary reluctance on matters affecting the environment, and apparently under intense international pressure, announced that it would ban all worked ivory imports and would partially ban imports of raw ivory. And, at the same time, The Times announced under a bold heading ‘Jubilation As Hong Kong (the centre of the world’s ivory trade) Bans Ivory Imports’. Most dramatically of all, Kenya’s President Moi arranged for the burning of 12 tons of ivory (worth £2.0 million) which had been confiscated from poachers during the last five years. All seemed to be well. But then difficulties arose. Zimbabwe, Botswana and South Africa complained that their elephants were not in danger and that, in their countries, poaching was under control. The next step is to be the meeting in October 1989 of the 102 nation Convention on International Trade in Endangered Species which will have to wrestle further with the problem. The Economic Recovery Programme (ERP) came to an end on 30th June 1989. On balance it has been a successful programme, though formidable problems remain. Between 1978 and 1985 overall growth reached an average of only 1.5% per annum and, since the population was growing at an average rate of 2.8% per annum, this represented a decline in living standards. In 1986, however, this situation was reversed with an economic growth rate exceeding that of the population at 3.6% and in 1987 at 3.9% while in 1988 the growth rate reached a level of 4.1% Export income grew and the contribution of non-traditional exports, though small, showed particular promise. Employment, except in minerals, rose. Many consumer goods again became available in the shops though generally at a high price and, following a reasonable series of harvests, food was generally available, though special measures had to be taken to deal with local shortages caused by flood damage earlier this year. The improvement in the economy was sufficiently visible and pervasive to bring about an atmosphere of hope and expectation, leading to an improved state of morale and a spirit of enterprise. While the importance of these gains must not be underrated, they fell short in certain important respects of the targets set out in the ERP. Overall growth at 4.1% in 1988 failed to reach the planned growth figure of 4.5%, while official export revenues were substantially less than planned expectations. Inflation, which was expected to have fallen to 20% in 1988, in fact remained stubbornly at 28.2% These outcomes do not invalidate the policies implicit in the ERP, but expose the unreliabilty of some statistics and the difficulty of forecasting in present circumstances. For example, in respect of export revenues, the true situation may be considerably better than the official figures suggest. Total exports in 1988 are estimated to have been nearer to US. 686 million than the official figure of US$ 362 million in view of the substantial volume of exports that are at present going unrecorded. Notwithstanding these shortfalls in performance, the trends set up by the ERP were promising. But great difficulties lie ahead. The two most critical problems are reduction of the rate of inflation and narrowing the gap between export earnings and import requirements. High rates of inflation present a constant threat to standards of living and, in the absence of indexing, wage adjustments always lag behind price increases. Inflation creates incessant cost problems for industry and places serious impediments in the way of economic forecasting. As to the trade gap, exports pay for no more than a third of imports, the shortfall being made up chiefly by external aid in the form of loans and grants. This degree of economic dependence is highly undesirable and explains the great importance rightly placed by the Government on a vigorous programme of export promotion. But neither of these tasks is easily accomplished. The main engine driving inflation is the excessive growth of the money supply and the expansion of credit. By addressing these problems the Government hopes to bring down inflation to 20% by the middle of 1990. Part of the difficulty lies in the financing of the recurrent budget, inevitably made more difficult by the increase in wages and salaries in the public service announced in the budget speech, increases essential to morale not only in government, but also throughout industry and the parastatals where equivalent rises are expected. Nevertheless the budget for 1989-90, as in 1987-88, relies on borrowing from the banking system to fill the gap between revenue and expenditure, though only to the modest extent of Shs 600 million, amounting to 0.4% of total revenue. The most serious problem lies in the expansion of credit to the marketing boards and cooperatives. The ERP aimed to contain the increase in credit to 15-20%, but in the event it rose by 23% in 1985-87 and 55% in 1987-88. The aim in 1988-89 is to limit the growth of credit to 30% Much has been said about the inherent inefficiency of the marketing boards, but there are also practical reasons for their insatiable need of funds. The dilapidated state of the roads and the obsolescence and inadequacy of transport vehicles have caused great difficulty in the movement of crops, leading to increased costs both in the transport sector and for the financing of stocks. These problems have been exacerbated by a substantial growth in production, especially of maize and cotton, and the inadequate capacity of processing factories, particularly in the case of cotton, tobacco, sisal and coffee. Between June 1986 and March 1989, credits to the National Milling Corporation grew from Shs 2,465 million to Shs 6,249 million while advances to the cooperatives increased almost sixfold. During this period the National Bank of Commerce was obliged to resort to the Central Bank to finance the needs of the economy including the crop parastatals and the cooperatives, and Central Bank advances to the National Bank of Commerce rose from Shs 418 million to Shs 40,595 million. The control of these inflationary influences lies not only in an improvement of financial management within the marketing parastatals themselves, but in the rehabiltation of Tanzania’s entire transport system and the rebuilding and expansion of processing capacity. Vigorous steps are in train with the help of external aid to rehabilitate transport and crop processing establishments, but, especially in the case of transport, it will be a long haul. The improvement of transport and communications will also boost exports. Furthermore, the Government plans to extend the ‘retention scheme’ under which exporters may retain up to 35% of their export earnings in foreign exchange to finance machinery spares and designated imports of consumer goods. This arrangement acts as a strong incentive to traders seeking to enter export markets. Banking facilities in foreign currency are to be established at the National Bank of Commerce to accommodate traders’ export earnings. These arrangements will help to avoid the bureaucratic delays and uncertainties associated with applications to the Central Bank for foreign exchange and will greatly simplify the satisfaction of exporters’ requirements obtainable only in foreign currency. A further devaluation of the shilling from Shs 137 to 145 to the $US will also increase exporters’ profit margins in local currency terms. Closing the trade gap will call for unremitting effort over a number of years. Apart from traditional exports, Tanzania has no great experience of exporting and a learning process will have to accompany the efforts of entrepreneurs, who, in increasing numbers, are attracted by the idea of entering the export field. Active consideration is now being given to the creation of advisory and information services for the benefit of traders entering foreign markets for the first time. The exploration of new commodities and new markets is all the more important both because of the stagnation in the world prices of traditional products and also because of the greater security to be obtained from a wider spread of export commodities. Competition among primary producers desperate to solve their foreign currency problems seems likely, in t he absence of natural calamities, to depress the prices of many traditional products in the near future. Although, in common with previous budgets, much attention has been given to increases in government revenue to meet expenditure needs and reduce the impact of bank borrowing, the importance of psychological influences has not been overlooked. Thus the budget provides for an increase in the minimum wage in response to inflation, while the income tax threshold has been raised. At the same time income tax liability has been reduced. The psychological effects of budget changes are of considerable importance at all income levels for the successful prosecution of policies for economic recovery. Nevertheless, the fact has to be faced that, in the words of the Minister of Finance in his budget speech to Parliament “development is a long journey and there are many pit falls along the way”. One such impediment is the growing obligation in respect of the payment of interest and capital on external debts, which are a prior charge on the country’s foreign exchange resources. In 1970 Tanzania’s external debt service was equivalent to 5.3% of export earnings but by 1987 obligations had risen to 18.5%. Discussions with the World Bank, the IMF and bilateral donors are continuing with a view to a reduction of the debt burden by extending the repayment period in certain cases. The recent decision by Belgium, France and the United States to convert loans into gifts follows similar previous action in the same sense by Britain, France, West Germany and some other countries. – Tanzanian nationals working abroad can now open foreign accounts with the National Bank of Commerce or Bank of Tanzania. Considerable importance was attached by the media in Tanzania to the speech given by Zanzibar Chief Minister Omar Ali Juma at a seminar in London organised by the Britain-Tanzania Society on May 20th 1989. Dr. Juma said that it was high time Zanzibaris ignored past socio-political sentiments and set about strengthening unity in the interests of developing the country. In a follow-up news item under the heading ‘London Society Clear on Isles’ readers of the Daily News were informed that members of the Society had developed a new outlook on the current political and economic situation in Zanzibar following the Chief Minister’s address. The writer went on to state that ‘several society members interviewed explained that the Chief Minister’s speech has checked opposite views held by some of the society members, particularly on reports spreading here that Zanzibar was violating human rights …. seminar participants seemed to agree with the speech which explained the sources of the current problems and their objectives’. Dr. Juma said that the Isles’ disturbances were caused be racial sentiments, former political outlooks and the notion by some people that Zanzibar was being turned into an Arab country. The Chief Minister said that many of the problems were caused by discontented politicians, opportunists and self-exiled persons. Members of the Britain-Tanzania Society have received a full account of the speech and the subsequent day-long discussion which covered almost every aspect of life in Zanzibar. In a later development reported in the Daily News (on June 16th) the Chief Minister restated the view of the Zanzibar Government on the holding of a referendum on the fate of the Union between Tanganyika and Zanzibar. Dr. Juma criticised Government adversaries who had appealed to the United Nations to arrange a referendum. Dr Juma said that the Union was ‘our own creation and all along we have been perfecting it without seeking the advice of anybody abroad … no foreign institution can suggest, leave alone dictate to Zanzibaris how they should govern themselves … political activities in the isles operate on established procedures …. problems arising in the Union are tackled using the machinery we have set up’. Zanzibar’s former Chief Minister Mr Seif Shariff Hamad was arrested with three others on May 10, 1989 for holding illegal political meetings on Pemba island. According to the African Economic Digest, four days later he faced a further charge of illegally obtaining state secrets. The Chief Public Prosecutor was said to have told a magistrates court that the police had uncovered 10 kilos of secret documents. These were said to be intelligence reports and descriptions of military installations. Hamad leads a group that was expelled from the ruling party (CCM) in May 1988 (Bulletin No.31). Government and Party leaders were said, according to the article, to have accused the group of trying to break up the Union between Zanzibar and the mainland and of advocating a referendum on the matter. A few days before these dramatic events (throngs of people were said to have lined the route to the packed courthouse, according to another report) the Daily News stated that the Zanzibar branch of the Tanzania Workers Organisation (JUWATA) had deplored at a rally ‘political cheats and opportunists’ who were undermining the stability of the Isles. The misguided elements ‘must be fought with all vigour’ the workers declared. Later, according to Africa Analysis, the charge of conducting an illegal assembly was dropped and a lengthy dispute between prosecution and defence developed on the subject of bail. At time of going to press it is understood that the accused had not been granted bail. The Daily News took up the story in a number of articles stretching through until mid August. It was learnt that charges against Hamad’s co-accused had been dropped but that legal aid for Hamad, which was being provided by the University of Dar es Salaam Legal Aid Committee, had been withdrawn. The police had threatened to bring Hamad to court in handcuffs to stop him waving to the people but the magistrate had said it was not a crime to wave to people. On August 1st the paper said that 25 state documents described as top secret which should have been handed over had been found at Hamad’s house. Hamad still faced a charge of holding an illegal meeting in Pemba. Just before the Bulletin went to press in late August the state prosecutor was said to have applied for future hearings to be held in camera because of the sensitivity of the documents. The magistrate was considering the matter. Meanwhile, Africa Events published five articles under the headings: ‘Tense But Calm’ (immediately after the arrest), ‘Fears of a Drift’ (referring to financial changes in Zanzibar which might slow down the integration of the Zanzibar economy with that of the mainland), ‘Upstairs Downstairs’ (referring to the ‘dizzying, whirlwind’ career of Hamad), ‘Zanzibar Handcuffed To Its Own Indecisions’ (on the handcuffing of Hamad) and ‘Too Hot To Handle’ (speculation as to why legal aid had been withdrawn). In the article on Hamad’s career the writer wrote of him, during his time as Chief Minister as ‘young (43), dynamic, educated, extremely diligent …. he demanded more and more from his people.. he developed the habit of turning up unannounced at different Zanzibar offices and meting out instant punishment to those not at their desks; he became very popular’. But ‘Zanzibar politics are insular in the extreme. People are highly aware politically but their view seldom extends beyond the Zanzibar Channel ‘ . .. . Hamad was thought not to have sufficiently mobilised support behind the Party’s choice for President in the last elections. He came into disfavour at the highest levels’. ANC HQ MOVING TO TANZANIA ? According to the Independent (August 9,1989) the headquarters of the South African African National Congress (ANC) will be moved shortly from Zambia where it has been since the early 1960’s to Tanzania. The Secretary General of the ANC. Mr Alfred Nzo was said to have confirmed an earlier report in the Daily Telegraph that some thousands (believed to be about 5,000) South Africans exiled in 2ambia were moving to Dakawa in central Tanzania. According to the Telegraph the reason was that President Kaunda of Zambia felt that the presence of ANC guerrillas and officials had begun to destabilise his government especially in view of the serious state of the Zambian economy. The Independent said that the move ‘represents a final admission by South Africa’s neighbours that they cannot host the movement in the face of Pretoria’s hostility’. But an ANC spokesman in London was quoted as saying that the project to move the ANC out of Zambia had been agreed years ago and that the Headquarters would not be moving. Africa Analysis reported in its issue of May 26th that 1,000 ANC personnel understood to have been expelled from Angola were being transferred to what it described as a huge camp at Dakawa, on the Dodoma Road, some 70 kilometres north of Morogoro. This was reported at about the same time as the arrival in Dar es Salaam of a Russian Aeroflot airliner (on May 18th) after a mid air shoot-out with alleged hijackers. When the airliner landed at Dar es Salaam airport one South African with a bullet wound in the chest and an injured Aeroflot security official were ferried by helicopter to Muhimbili Hospital. Three other men were said to have been interrogated. The Daily News said that the aircraft was on a scheduled flight from Luanda to Moscow when a group ‘led by a Boer’ attempted to divert the plane to Johannesburg. The aircraft had landed in Dar es Salaam only to allow two people injured in the hijack attempt to disembark. The Minister of Communications and Works after visiting the airport said that he could not at that time give the plane’s next destination. Africa Analysis reported that there had been much speculation in Dar es Salaam about what had actually happened. The plane might have been taking ANC fighters for training in the Soviet Union. It was more likely that it was ferrying 200 ANC personnnel to Dakawa. But there were some people who thought that ANC fighters may have mutinied and others who speculated that the hijackers had been ANC dissidents being brought out of Angola under guard from an ANC prison near Luanda under the terms of the Angola peace settlement. On June 19th African Concord stated that an ANC official had confirmed that the person who had tried to hijack the plane was a South African spy who had tried to join the ANC. Bradely Richard Stacey (27) was subsequently charged in Dar es Salaam with endangering the lives of passengers and sentenced to 15 years in prison. The Judge said he would have imposed a 20 year sentence if Stacey had not pleaded guilty. Under this heading, on August 22nd, the Daily News reported that the ANC College at Mazimbu on the outskirts of Morogoro had grown during the last ten years into not only a fully fledged secondary school for South African refugees but also a complex college including primary and nursery divisions as well as a day care centre. Describing how Mr Salim Ahmed Salim (47), Tanzania’s Deputy Prime Minister and, at different times, the Minister of Foreign Affairs, Minister of Defence and Prime Minister (as well as former President of the General Assembly of the United Nations) had been elected by the Organisation of African Unity as its new Secretary General WEST AFRICA magazine stated in its August 17-30 issue that this heralded the ‘dawn of a new realism’. He was considered amply qualified for the post and, being from a front-line state, would enhance his credibilty given the organisation’s present focus on Southern Africa. Despite the usually clannish nature of the Francophone states within the OAU and their apparent stranglehold on the Secretary Generalship, Mr. Salim’s qualifications and commitment were such that he was able to win on the third ballot the article said. He succeeds Mr Ide Oumarou from Niger. The FINANCIAL TIMES reported that Mr. Salim had obtained 38 votes – more than the two thirds majority needed from among the 49 member states. The AFRICAN ECONOMIC DIGEST in its issue of July 3rd stated that donors have reacted coldly to Tanzania’s latest budget. Sticking points continued to be exchange rate policy and the speed of structural reforms. Donors had been hoping for a faster depreciation of the Tanzanian Shilling than the 4.8% devaluation announced in the budget. The Government was said to have consistently stated that it would restructure the export marketing boards but the likelihood of this taking place soon was being treated with some scepticism by donors according to the article. An investment code expected since mid – 1988 was apparently not now expected before late 1989. ‘The Serengeti. Even its name resounds like a drumbeat from the heart of Africa. How can one convey the majesty of its immense plains. The light is dazzling. The smells of dust and game and grass – grass that blows, rippling, for mile after mile in the dry highland wind, with seldom a road and never a fence; only the outcropping gaunt granite kopjes and their watching lions, the thorny woodlands, the water-courses with their shady fig trees and the wandering herds of game. Since the Serengeti became a national park nearly forty years ago, the wildebeest have multiplied until there are now one and a quarter million. Together with half a million gazelles, 200,000 zebra, 50,000 topi and 8,000 giraffe – to say nothing of 1,500 lions – they offer a last glimpse of the old, wild Africa as it was before the coming of the Europeans; and when the wildebeest embark on their seasonal migrations, stampeding across the rivers, stretched out from horizon to horizon in endless marching columns that take three days and nights to pass, they transform these vast Tanzanian plains into the greatest wildlife spectacle on earth’. (Extracts from an article by Brian Jackman in the SUNDAY TIMES of 25th June 1989). Such is the intention behind a new World Bank IDA Credit of US$ 25.1 million recently agreed. WORLD BANK NEWS in its issue of June 29, 1989 noted that Tanzania’s production of cashews and coconuts had declined by 85% since the 1970’s as a result of inappropriate pricing, ineffective marketing policies, lack of production supplies and plant diseases. The project will establish seven cashew development centres and three coconut seed farms to grow plants and seeds for distribution. Research will be expanded and training will be provided for extension and research staff. Credit is included for farmers and t raders. Annual production is expected to double to 45,000 tons of cashews and one billion coconuts by the year 1999. In the INDEPENDENT magazine of July 1st Glenys Kinnock, wife of Labour Party leader Neil Kinnock, paid tribute to Archbishop Trevor Huddleston who leads not only the Anti-Apartheid movement but also the Britain-Tanzania Society. ‘At 76, still sparkling with fun, still spreading vitality, still fierce for freedom, my hero, Trevor Huddleston, is very much alive’ she wrote. She went on to quote Archbishop Tutu as saying: “He is so un-English in many ways, being fond of hugging people, embracing them and in the way he laughs. He does not laugh with his teeth, he laughs with his whole body, his whole being”. Glenys Kinnock went on to write ‘Trevor Huddleston is a man of action. He has retained his fighting spirit, his resolve ….. action not words is his continual message everywhere ….. Last summer the Archbishop was one of the first to arrive early on Saturday morning at the huge Nelson Mandela Birthday Concert in Wembley and one of the last to leave late on Saturday night. As he sat in the front row of the Royal Box throughout the day thousands of young people turned away from the stage to greet him. His face glowed with smiles as he returned the waves whilst the music thundered out across the stadium and across the world. He was having a lovely time – not diminished one bit by the fact that he hardly heard a single note through the ear plugs that he had firmly fixed in place throughout much of the day. It’s about the nearest that Trevor Huddleston has ever come to compromise’. Writing in the SUNDAY TIMES feature ‘A Life In The Day Of’ Naomi Mitchison, the traveller, adventurer and prolific writer, described some of her tastes. 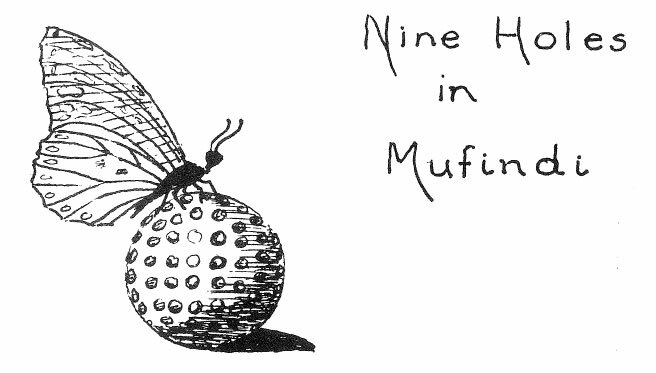 She obtains muffins from Marks and Spencers and eats jam made from Japanese quinces. When in Botswana, where she is the adopted mother to the Ba Kgatla, Chief Linchwe arranges for her to get coffee from somewhere other than South Africa. When she is in Britain however “I have coffee from the Chagga Cooperative in Tanzania” she wrote. The JAPAN TIMES devoted a full page to Tanzania on the occasion of the 25th Anniversary of the Union. Greetings from advertisers included contributions from Nippon Koei Co. Ltd, Toyota Tsusho Corporation and the Konoike Construction Co. Ltd. Mr. Kikuo Ikeda, Chairman of the Japan–Tanzania Association wrote about current Japanese aid schemes which include an Agricultural Storage and Transportation System Improvement Project in Iringa and feasibility studies on agriculture in the Lower Hai and Lower Rombo areas and on urban development in Dar es Salaam. He also reported that some 35,000 visitors had attended the Tanzania Exhibition in Tokyo in February 1989. (This was described in Bulletin No. 33 – Editor). Under this rather imaginative heading, SOUTH magazine in June reported that Dar es Salaam is at war against an invasion of rapacious Indian crows. ‘They steal food, kill chickens, cause commotion in the early hours, and steal buns, tomatoes, fish and meat from street markets. Now they are said to have begun attacking people. Tanzania’s Game Department tried to eliminate them last September and killed more than 4,000. But the birds are now adept at dodging bullets. In January they attacked a man who was 15m up a palm tree trying to pull out a crows’ nest. By the time he reached the ground his feet were bleeding and swollen. The crows were introduced to Zanzibar about a century ago from India to provide a sanitation service by eating garbage. Despite government rewards for collecting eggs and destroying nests they spread to the mainland where Dar es Salaam’s poor waste disposal system offered an inviting feast’. ‘Tanzania’, wrote AFRICAN CONCORD, on July 17th, ‘once known as the sick man of Africa, is responding to IMF medicine and a transfusion of Western aid. The country has just completed a three-year overhaul which has breathed new life into its stagnant economy, pleasing Western donors and Tanzanians alike’. “The Economic Recovery Programme is a resounding success” said IMF Director Richard Erb during a visit in May. As one African diplomat remarked: “People can now get their essentials, from food to clothes, without queuing or resorting to the black market”. A report in the BRITISH MEDICAL JOURNAL on August 5th by Dr. Yorston of Mvumi Hospital and colleagues at the Institute of Opthalmology in London described a five year survey into Uveitis (inflammation of the iris and related structures in the eye) in children at Mvumi. Of the 254 children seen with the disease half were under two years old. No consistent abnormality accounted for the uveitis but there appeared to be a geographical distribution with many cases in Iringa, Shinyanga, and Dareda but few in Mbeya and Sumbawanga. Most children recovered within six to twelve weeks. It was suggested that the disease might be a response to either parasitic, viral or spirochaetal infection in early infancy. Under this heading the INDEPENDENT in its June 20th issue reported on the WOMAD World Music Festival which took place ‘among the fish and chip shops and stunning sunsets of crumbling, jolly Morecambe …. The African content was threefold in type. Delicate, melodic filigree from traditional Ugandan acoustic instruments, the venerable Gambian kora maestro Amadou Jobarteh and loping electric guitar and drum dance-floor pop, ‘soukous’ -influenced but with an East African choppiness, from the Tanzanian Remmy Ongala and his orchestra Matimila who appeared to be playing everywhere the whole time’. Reviewing what it described as Zanzibar Minister of Finance’s cautious budget for 1989/90 the AFRICAN ECONOMIC DIGEST (May 29) wrote that the removal of subsidies, cuts in the civil service and higher revenues following trade liberalisation had allowed income and expenditure to balance in 1988/89. Recurrent expenditure was projected at Shs 2,779 million against Shs 1,74-0 million in 1988. Development spending was to increase from Shs 5,000 million to Shs 5, 398 million (4-6.9% for communications) but 92.7% of this would need to come from external funding. GDP growth in Zanzibar last year was unchanged at 1.3% compared with mainland growth of 4%. A popular announcement was that there would be no new taxes this year because of the rise in income. Truth, said the FINANCIAL TIMES on June 28th, is sometimes stranger than fiction. The former German naval steamer Graf von Goetzen on Lake Tanganyika which was scuttled by the Germans during the First World War and subsequently refloated under British rule and renamed the Liemba, continues to sail Lake Tanganyika today. Her career is ‘as swashbuckling’ as the Humphrey Bogart character in the film the ‘African Queen’ – a drinker, smuggler and all-round reprobate. The article went on to explain that the Liemba still carries Germans – tourists – as she plies the 420 miles of blue, crystal-clear water that stretch northward from Zambia to the former Belgian colonies of Burundi and Ruanda. But the Liemba’s 4-inch gun has gone and it s place on the upper deck has been taken by less lethal contraptions – safari Landrovers bristling with dried sausages and piled high with cases of beer. Carrying tourists and their vehicles up to gorilla country in the mountains of Rwanda, however, is only a sideline. The Liemba is, above all, ‘a floating den of smugglers who successfully manage to break every import, excise and exchange control in the region’. The lengthy article described how subsidised Zambian goods, dried fish, gold and various currencies change the ship into a ‘mobile market place and trading floor’ with profits sometimes as high as 400 per cent. As one of the smugglers said: “The Government calls it smuggling; we call it business”. Describing the completion of the US$ 18.0 million port development at Dar es Salaam the AFRICAN ECONOMIC DIGEST (July 24) stated that some observers were now suggesting that it could compete with Mombasa where efficiency has deteriorated sharply. The Finnish financed project involved the conversion of three general cargo berths into a 13 hectare container terminal with ship to shore gantry cranes and several rubber tyred container carriers. Tractor and trailer units have been introduced as well as a rail-mounted gantry. The first reported case of AIDS in Tanzania (from Kagera Region) was as recently as 1983. But, according to a Professor in the University of Dar es Salaam, there are now estimated to be 400,000 people infected by the Human Immunodeficiency Virus (HIV) which can lead to AIDS. The male to female ratio is approximately 1:1 reflecting the dominance in Tanzania of heterosexual transmission: Distribution by age shows peak prevalence for women in the age groups 15 to 25 whereas the majority of infected males are in the age group 25 to 35. The spread of HIV follows the major communication routes with dramatic differences in the geographical distribution. In the Kagera Region with 1.3 million inhabitants some 11.9% of the adults were HIV positive in 1987. The rate was as high as 32% in Bukoba town. The extent of the catastrophe in the town is illustrated by the fact that in the age groups 25-34, some 41% were affected and in babies below one year in age 23% were HIV positive. 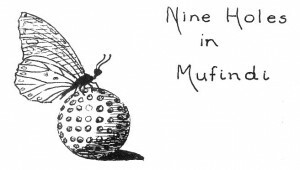 (An account of what was described as the ‘AIDS Horror’ at Kanyiga village, 25 miles from Bukoba, was given in Bulletin No 31). The true prevalence and the speed of dissemination in most of the country is not known but one source estimated that the affected population is now doubling every six to eight months. According to the World Health Organisation, for every reported case, there are in the population 50-100 infected cases. According to some health experts there could be as many as one to two million people affected by the end of this year. Most of these people will be subject to emotional stress and a larger number of relatives and friends will also need assistance in dealing with the disease . “We are talking about anywhere between five and ten million people needing counselling if testing instruments were available for all” said Dr. G. P. Kilonzo, Head of the Psychiatric Unit at Muhimbili Medical Centre. He said that the emotional reaction of individuals to HIV infection and the neurological and psychiatric consequences of the disease can have a far reaching impact unless emotional support is given. Cases of suicide, stigma, anger, depression and family turmoil are issues that need to be dealt with through counselling he said. Dr Gabriel Lwihula is worried about the orphan problem and how Tanzania will be able to cope with the orphan children and the aged whose survival must depend on support from persons dying of AIDS. A National Aids Task Force was set up in 1985 and this led the way to the National AIDS Control Programme which the government launched in mid 1988. Emphasis is being placed on bringing about behavioural change. Most people are said to now prefer what is known as ‘Zero grazing’ in reference to sticking to a single partner. Many jokingly refer to what are called ‘UWT (the Tanzanian Womens’ Organisation) marriages’. Others refer to Chinua Achebe’s novel ‘One man; one wife’. At a seminar in Arusha in July 1989 Dr W.M. Nkya of the Kilimanjaro Christian Medical Centre said that transmission of AIDS was complicated by the existence of ‘infected pools of people and mobile transmitters’. He explained that prostitutes and barmaids were likely to be in the infected pool while young business men, truck drivers and privileged civil servants were likely to be among the transmitters. At the same seminar the Tanga Regional Cultural Officer, Mr V. Mkodo said that a number of men were opting for schoolgirls to ‘quench their sexual thirst ‘as they were considered to be safe from the disease. It was also suggested at the seminar that it would be a great help if the government issued a directive on circumcision of men as uncircumcised men were thought to be at greater risk. On Peasants Day in July this year the Association of Tanzania Family Planning had what was described as a ‘field day’ when it sold 11,000 condoms to visitors to the 13th Dar es Salaam International Trade Fair. Condoms, at Shs 5/- each, were said to have been selling like hot cakes as preventive measures against AIDS. (From SHIHATA, the Daily News and the book reviewed on page 31). Readers of the Daily News have been responding to a question asked by another reader recently on the genesis of the Kiswahili word ‘Mzungu’. They explained that among the Wagogo people there are such terminologies as ‘Mulu-ngu’ describing God with ‘Mulu’ meaning an exceptional and ‘-Ngu’ meaning any being having power over nature. ‘Msungu’ is purely Bantoid spoken in Nigritic tone. When a white man first trod in East Africa the local people regarded him as different. They thus christened him ‘Musu-Ngu’ that is demi-god or godman’. The Society for Environmental Exploration in London is in the midst of a year-long research project involving some 200 young British volunteer research assistants ac companied by a staff comprising scientists, logisticians, engineers, mechanics and medical personnel. The project is being organised through the Ministry of Lands, Natural Resources and Tourism and Tanzania National Parks. At the end of July 1989 the first six of a larger number of Tanzanian scientific consultants (from the University of Dar es Salaam) had also joined in the initial work together with Dr. M.A.K. Ngoile, Director of the Institute of Marine Sciences in Zanzibar. The advance party arrived in Tanzania in early July and they were followed by the first of four groups, each of which will spend some three months undertaking environmentally important tasks in Tanzania. Eibleis Fanning of ‘Frontier’, the expeditionary arm of the Society, told the Bulletin that the aim of the project was to harness the enthusiasm of people committed to environmental protection. Participants are working at the Pande and Kiono forest reserves on plant collecting, forest mapping and bird netting; on Mafia island on sea clams and starfish, the biological control of the coconut eating rhinoceros beetle, and on permanent study plots in the mangroves of the northern coast; a group is also working at the Mikumi National Park and another at the Rufiji Delta on a mangrove sedimentation programme. Four upper floors of the Ministry of Home Affairs headquarters in Dar es Salaam were gutted by fire on the night of May 19th 1989. The damaged floors had accommodated the offices of the Minister, Deputy Minister, the Inspector General of Police and several commissioners in the Police Force. This fire follows the loss by fire of the Bank of Tanzania headquarters in 1984 and offices of the Audit Corporation in 1988. Tanzania, Uganda and Zambia agreed on May 5th 1989 to set up a joint airline to be known as ‘Africa Joint Services’. The airline is to operate regional and international flights. Costs will be shared equally by the three countries. Meanwhile, Swissair and Belgium’s Sabena have started joint twice-weekly flights from Brussels and Zurich to Dar es Salaam via Jeddah. A special team set up to study the establishment of a television station for Tanzania mainland will soon present its final report to Government. The Party programme directs that Tanzania mainland should have television by the year 2,000. The Ministry of Agriculture and Livestock Development has ordered consignments of wasps from the International Institute of Tropical Agriculture in Nigeria for the biological control of the cassava mealybug in Tanzania. The wasps will be bred and multiplied at Kibaha in the Coast Region. Some 18,000 hectares of cassava have been affected by mealybugs since the out-break in 1987. CHIMPANZEE RECORDS STOLEN Two years of painstaking research work on chimpanzees in the Gombe Stream National Park may have been lost forever when thieves broke into the house of the world famous scientist Jane Goodall in Dar es Salaam at the beginning of July. They made away with 40 video cassettes. The thieves, who are believed to have reached her beach front house at Msasani by boat, also took away two outboard engines donated to the national park – Daily News. The Commonwealth Institute in London is about to launch a ‘Theatre in Education’ project to be based on Tanzania and using British and Tanzanian actors. There will be half day-programmes designed for upper secondary school pupils which will be given first in London and then at schools in the West Midlands, the Isle of Wight, Bedfordshire, West Sussex and either Dundee or the Borders Region. Mr. Turan Ali, Performing Arts Officer at the Commonwealth Institute and Mr Ghonche Materego, Head of the Theatre Arts Department of the National Arts Council in Tanzania and Adviser to the Project told the Bulletin that the play will look at the notion of independence and economic relationships in the post-colonial period. There will be a performance for the public on October 26th 1989. Tickets (£2.50) are obtainable at the Education Centre of the Institute.